Stéphane Hessel, one of the great old men of the world still standing, inspired all of us who participated in the Russell Tribunal on Palestine over the last several years. He died peacefully in his sleep last night at the age of 95. That he never abandoned his principles – from participation in the French Resistance, through his role in helping to draft and then signing The Universal Declaration of Human Rights, to his inspirational support to all those who seek justice for the Palestinian people, he never retreated from passionate engagement in whatever he believed to be right. That he was still active and filled with resistance, joie de vivre, and hope, meant the world to all of us fortunate enough to witness his extraordinary belief in humanity’s ability, and its duty, to correct its wrongs. We were so very lucky to see , and experience, a way of being – fierceness joined seamlessly with affection and grace: his manners seemed flawless – that has disappeared, for the most part, from the world. 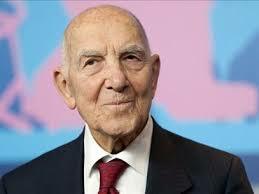 I am not sad, Stéphane Hessel. Though there may be tears. You have won the race. Please see the video below of one of Stéphane Hessel’s last talks at the Russell Tribunal on Palestine that occurred October 2012 in New York City. Enjoy as we did his envigorating and beautiful spirit; which of course his death has released to continue its never ending journey in, hopefully, ever increasing numbers of us.